Oh doctor I’m in trouble. The head’s pounding, the throat’s sore, body’s aching, memory’s shot and I’ve a twatters deadline to meet. Jeeeesus, what am I gonna do?! Not to worry young man, three hail Mary’s, an our father, a decade of the joyful and glorious mysteries and a bottle o’ these pills ‘ill sort ya. An impenetrable haze lifting, blinding light on the horizon and I’m in Dublin Port and Kev giving a training course on Stena Lines parking meters. I think Maureen ends up paying for us all, before I spot Paul sitting proudly at the gold plated wheel of his spanking, shiny new 300 seater bus, heart swelling with pride in his chest, eyes and newly brightened teeth shining in the moonlight, as he warns us all not to touch anything. Peter Pieman, Noah like, checking in the multitudes (what! !…no Pie Girlettes, Ronan or Dom…how‘s he gonna manage this crowd?? )….aah, but Big Dunk (the icon) is there also, to ensure all are safely on board and Frank dished out the first of the Oatfield Toffee Mints. God be with the days of the Minister for Cans!!?? Bus safely parked on deck, I’m not sure if Big Dunk (the icon) had already given us a blast of the bare necessities?….but we eventually made it up the long, steep, endless steps and found our way into the main cabin to gain our position at the starboard, front end of the boat. Queue for Hughie’s legendary breakfast, hunger sated and it was time to settle down for the journey, exchange legendary and heroic tales of previous and future trips, the Clayton’s, Dalton’s and James Gangs getting the first card games going, pressing the flesh with new…and older members etc etc. We ran into loads of other blues from Fermanagh, Tyrone and all ends north, south, east and west of the country heading over for the derby. We also met school tours from Louth heading over to the derby and also the ManC v Spurs game. It wasn’t like that in my day. Peter Pieman seized the opportunity to spread the IT Gospel far and wide. Before long, the familiar sights of Holyhead and the sun shining brightly as we rolled gently down the gangplank, The Travelling Wilbury’s “Well It’s Alright” the first tune on our brand new, rockin play list, welcoming us to Anglesea and setting the tune for the next stage. It was indeed alright. The Golden Goal competition was first up and many hands were placed in deep pockets in a determined effort at gaining victory and fame. Alan Moran was the lucky winner as we found out on our return journey. JOR pulled out his latest edition of the quiz everyone wants to win. For the life of me, the doc’s pills haven’t fully kicked in yet and I forget the full title of the quiz, but I think it was “i4getthefcuknnameofthe####nquizsoletsgetonwithitquiz”, or something of that ilk. We were all grinning with extra confidence in the absence of Gary and Whamo, with Frank being the man to beat this time, but could he beat 300 of us? However, wily ‘ol JOR had a trick or three up his sleeve. This was indeed a quiz of three halves! 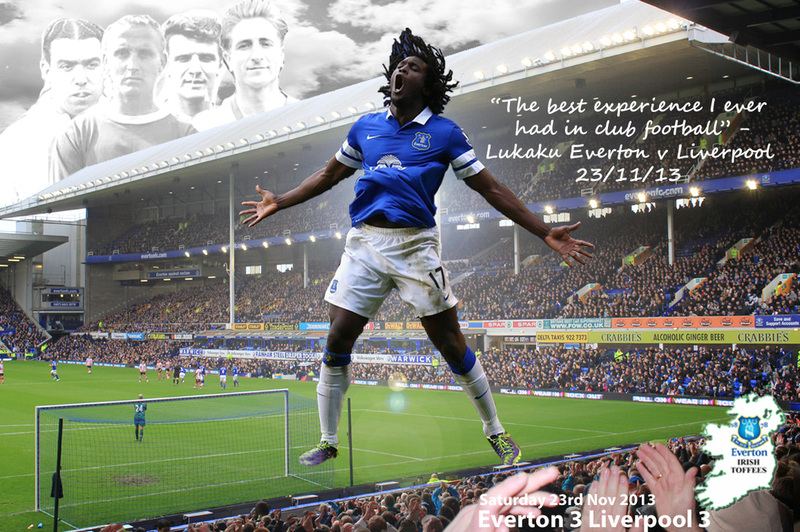 ?….1st half all Everton Q’s….2nd half all general sport Q‘s…3rd and final half, all things entertainment. I don’t have to tell you that many hearts dropped, contestants scratched their heads in perplexed confusion, many were seen to blab and blub…but most managed to regain their courage, composure and hair in time to put pen to paper, and answer as many Q’s as possible…in truth, very few. It was a source of wondermant and consternation to the organisers, that in a bus full of Evertonians and sports supporters of many years standing, that it was the all things general entertainment that gained the most positive results. Speaking of results, the pills still haven’t kicked in, but I know Rob kept the Limerick end up, but as for the winner of the quiz…the name was drowned out in all the excitement …but you can bet your life it was probably Dave or Alan. Of which clan I’m not sure, but you may just check the official report. You know who you are. A couple of face book pitstops and we were in Liverpool before we could say Merseyside. Paul parked us safely on the Kings Dock and we all headed on our merry way to our various establishments. A quick freshen up and most of us made our way to Liverpool One Centre for some shopping. The Everton 2 store was popular, as was the Sports Direct. For some reason, the omnipotent and omnipresent Big Dunk (the icon) was spotted at every doorway, lighting the way and guiding us all safely on our various expeditions. Shopping or non-shopping completed and packed back in the hotels and hostels, some made their way locally for further re-fueling, while JOR led a crack team of IT’s on a groundbreaking train and taxi expedition, to the Everton Derby Heroes Night in the British Legion Hall in Runcorrn. I tell you, walking into that loud, blue hall was the most thrilling experience ever. Every Everton song ever written and sung was being sang in our honour. It was a sea of blue with thundering, loud blue waves rolling and crashing from every wall. We were welcomed like long lost sons and daughters, and had ringside seats specially reserved and especially for us. We were treated as kings, queens, heroes, legends and we promptly proceeded to sign every shirt, picture, book and memorabilia placed in front of us. Bob Latchford, Kevin Campbell, Graeme Sharpe, Kevin Sheedy and Andy King all bowed in deference to our presence saying repeatedly “we’re not worthy, we’re not worthy”. Andy King even convinced our own Brendan King, that he was his long lost cousin and played for him at Waterford United once upon a time. Comedians (not us) and musicians took to the stage to entertain us before the food was spread out. Everyone claimed to be of Irish descent and told us stories of longing and yearning for the homeland. All wanted to be members of The Irish Toffee’s. We even took part in the charity draw, auction and last man standing bingo competition. Jimmy had placed his eye on a signed, framed action picture of Graham Stuart and pledged that he would bring it home with him, but as tickets were drawn, signed Ferguson, Latchford, King, Sheedy shirts selling for Celtic Tiger prices, we were fast resigning ourselves to going home empty handed. Jimmy was developing that beaten, defeated look, beads of sweat dripping from his fevered brow, hands clammy as hell, no amount of encouragement or consoling would do. However, in a moment of sheer bravado and genius, as the Graham picture was being raised for public display and the baying, salivating crowd was gathering around, Mags waltzed and pirouetted her way to the stage, waved the winning?? ticket in the air and brought the picture back to a very relieved, but excited Jimmy. I tell you, there wasn’t a dry eye in the house. Now, I know what goes on tour, stays on tour, but at that very moment, Joe professed his undying, unwavering, eternal love for all things Latch, as Donna rubbed her hands with glee and a still silence decended on the gathering. The laydees were all a big hit with Kevin Campbell…super, super Kev, super, super Kev, super, super Kev, super Kevin Campbell, and he applauded and re-applauded in style. Guy’s, ya gotta bring Andy King over for an IT night. He was just brilliant. The taxi bus back to the hotels in the early hours was made very short, as Donna sweetly serenaded us with various musical scores and a powerful rendition “2 out of 3 ain’t bad”. We couldn’t figure out if she was referring to Joe and Latch or forecasting the derby score!!?? Donna has promised a full concert on the next bus trip….with a possible performance of the full Calamity Jane soundtrack……watch this space. A bright, dry, fresh, cold Saturday morning and we all rose with great anticipation of a great day in store. Forecasts of 2-1 to us spread like wildfire. Hearty breakfasts downed and we made our way to a throbbing, heaving Goodison. The Park End was full of entertainments and screened past derby highlights, the roads around the ground were thronged with blue, blue, blue, programmes and memorabilia were selling as if the world was going to end at any time, guys on stilts kicking footballs, blue noses everywhere, a scent of victory was in the air. We climbed quickly up to our allotted places to a huge cacophony of sound and light,….and Big Dunk (the icon) was waiting for us there. We all raised our blue sheets as the Z Cars theme blared out and our Everton heroes ran onto the sacred sod. Game on, Pienaar showing the form, flair, passion and skill we know and require, Barkley, McCarthy and Barry majestic in midfield. Mirallas and Coleman raiding on the right, Jags holding central defence…we could see our team dominate and send us home with a priceless three points. But oh no, we are Everton, a klan corner, a ball missed and missed again, and there’s Coutinho to stab it easily home. It was as if a knife pierced our hearts and took every breath out of us. Not to worry, our heroes redoubled their efforts and before long Mirallas had us level and we breathed a sigh of relief. 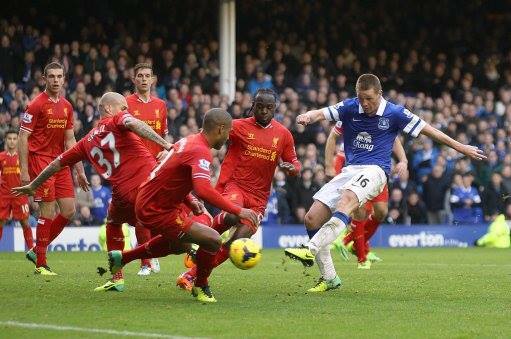 We continued to batter them, but a Suarez free kick found it’s way into the bottom corner. We couldn’t see how it happened. Where was the wall, where was Howard?? 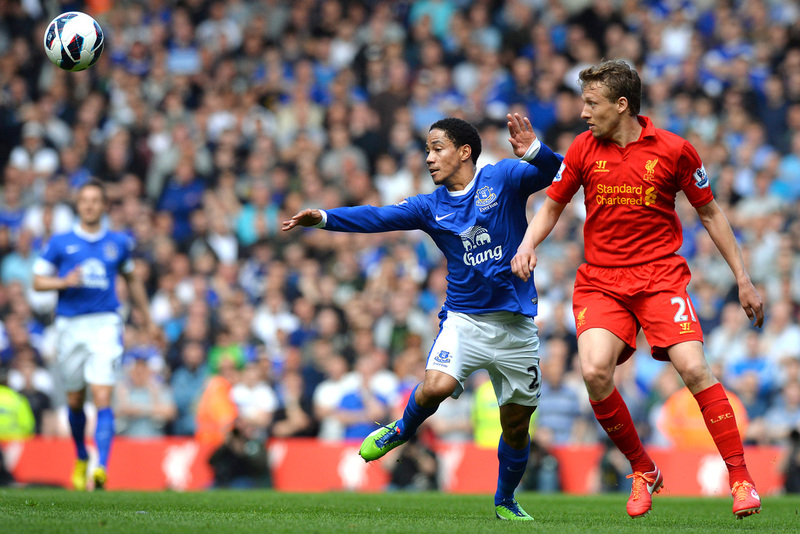 We became increasingly concerned as Baines was limping badly and Suarez was carrying on with his usual histrionics. 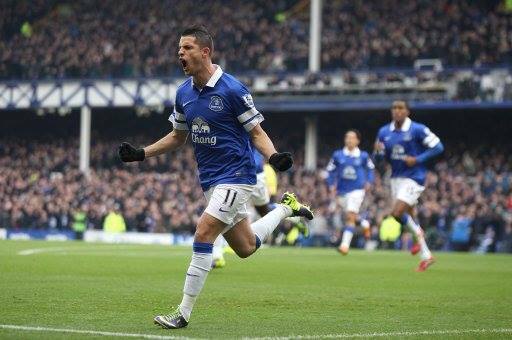 Mirallas decided to give him something to really trouble him and proceeded to kick “racism out of football”. Dowd for once decided in our favour and only issued a yellow. Suarez proceeded to act out the Drogba better than Drogba for the rest of the half, enraging the crowd, but scared the bloody hell out of us every time he got the ball. Half time and 1-2 down, we had been the better team but would desperately take a point at this stage. A young boy soprano tried to sooth us with a topping performance of a great Beatles tune, but we weren’t going to let this be, no way Jose. Shortly after the re-start and Baines limps off, Martinez brings on Deulofeu and bravely goes with 3 at the back. Deulofeu loses the first three balls that come his way and puts our defence under serious pressure each time. However, slowly but surely he gets into the game and his skill and runs frighten the life out of the red defence. Lukaku was at nothing and we all knowingly looked, winked and nodded..”Jose knew what he was at there alright. We should pack him up and send him back with a note to f o”….then, bang and bang again….fcukn great player….gerrin there ya boy ya….we had victory in our grasp, 7 mins to go….oh the thrills, the ecstasy….the highest, of the highest feeling…we are winners, we are winning the derby, we are going to win the derby…our time has come, we jumped, shouted, hollered, hugged, kissed….what a feeling. Another set piece, a flashing header into our net, 3-3 and Sturridge runs the length of the pitch to do his fairy pax de deus impersonation in front of the Gwladys. We looked on in shock and disbelief. Where the fcuk did he come out of? I didn’t even see him come on. This just can’t be true. An eternity of very long nervy minutes later, both sides missing chances to clinch it, Lukaku and Deulofeu doing everything they could to get us the win, and Phil Dowd eventually blows the full time whistle. To say we felt like it was a defeat would be a grave understatement. We had victory in our grasp, felt it in our bones. We were going to be talking of this day for years, attending heroes lunches in memory of this game for many a day to come. Our derby heroes would be pictured, signed and framed on every wall from now and into perpetuity…..but we blew our chance….blew our glorious chance…..again. We went from scaling the top of Everest to the pits of the Grand Canyon in fleeting seconds, the pinnacle of Kilimanjaro to the depths of the ocean. Is it forever Everton to be like this? Anyway, filtering outside to the waiting crowd, JQ was almost mugged for his Irish Toffee’s jacket by IT lovin’ Liverpudlians but held on for dear life. A quick spice burger and chips, walk away from the arriving Liverpool bus and into the Park End to greet our own heroes. Mix with loads of Belgians and New Yorkers!! while awaiting photo opportunities with Mirallas, Coleman, Howard and Pienaar. We belatedly taxi back to the Kings Dock and our still spanking, shiny new bus. In no time at all we were out of the city and on our way to Holyhead, excitedly talking and discussing the most minute details of the game. Big Dunk (the icon) called for order and requested singers and performers to line up for the latest instalment of the Rolling Thunder Revue. He attempted a few ditties himself from his vast repertoire before Peter chipped in with his old standard about his adventures in an old “seaside far away” and the one about Ruby taking her love to town. The shy and nervous cast remained in their seats as Big Dunk (the icon) called each prospective performers name out. Otherwise brave and fearless people hid down between the seats, others ran for the back of the bus, some tried to parachute out the door. However, in the second stroke of genius for the weekend, Big Dunk (the icon) called in the smooth, smoke fuelled baritone voice of Barry White to announce, that if enough IT’s performed their party pieces, that he would guarantee Maaaggs Tiiime before we reached Holyhead. Well, you never saw such a clamber to reach the front of the bus, we almost toppled over and Paul began to feel he was driving a tunnelling machine, as the front of the bus started boring holes in the motorway and the rear rose, Titanic like into the air. Peter Pieman and Big Dunk (the icon) rushed to stem the tide as Paul cried out for order. Frank herded everyone back to their seats and proceeded to shepherd all willing performers, calmly and quietly to the mic. I tell you we had all sorts of performing artistes from that moment on, dancers, musicians, singers, poets, comedians, jugglers, acrobats revealed themselves in all their glories and manifestations from that point on. Ronnie Drews cousin, Mickey Harte, still luxuriating in his tv and European successes, was first up and got things off to a rousing start with the “Big Strong Man”. Alan kept it going with “The Wild Rover”, Gav thrilled us with songs of Belfast children playing on wonder walls. Not to be out done, Geraldine brought the ladies to the fore with a rousing, passionate rendition of “Ireland’s Call”. There was no way Ireland were going to be beaten by New Zealand tomorrow after that performance. Maureen decided to lift the volume even further and “Molly Malone” belted out from the front of the bus. I tell you, if she had a barrow of cockles and mussels, she would have sold out there and then. Joe gave us an updated, uplifting version of his record breaking smash hit about his summer in Dublin. We‘re all taking the bus to the O‘Reilly‘s next summer and parking outside their house, for a great, blue IT holiday. There was also a few Everton songs sung in honour of Gary. I think I heard Simon and Garfunkel blasting out somewhere along the line also. Such was the excitement and frantic requests that even the reclusive, moody and broody JQ shook off the shackles, grabbed the mic, turned his back on the audience and immediately resuscitated the flagging career of the Beach Boys, who immediately announced their upcoming final, final world tour. Someone said it was Sloop John B, but no-one knew for sure. However, Frank was seeing to be tapping his foot in time. Big Dunk (the icon) reckoned that’s just not rock n roll. The hit of the night turned out to be Kev, as Danielle pushed him from his seat at the back, and with hip flask in hand belted out aldiliddledeealdiliddledeedee or something to that effect. It seems Kev has a bit of decluttering to do in d'aul shed over the winter months. We were all addled by now anyway, so we were well up for it. And so, the moment arrived, the moment everyone was waiting for, as Barry informed us that mmmMaaags Tiiiime was here. Up Maaags strode confidently to the mic, as a kind of hush enveloped the bus. Laryngitis forgotten, she regaled us with songs of trains a comin’, killin’ men in Reno, havin’ the blues in Folsom Prison. I can tell you now folks, there wasn’t a cricket stirring anywhere, she literally stopped the bus. Everyone agreed that Big Dunk (the icon) had finally got it right, when he told us Maaags could indeed sing better than Sophia Loren and Racquel Welch. The applause was deafening. Jimmy woke from his slumbers, framed Graham Stuart picture still in his grasp, as we were ferried past customs and onto our homeward bound boat. Up onto deck again, found our place in a super luxurious bar, had a few drinks, toilet breaks, excited and animated talk mounting over the weekends events and the Clayton gang , once again, cleaning out all comers in the cards. We were now feeling a little better about the result, as we waited patiently for Match of the Day. Big Dunk (the icon) turned up the volume on the tv and we all relived the highs, lows and excitement of the match. We finally caught the sight af Suarez bending the ball through a closing crack in the Everton wall and into the corner of the net. We reluctantly acknowledged a great goal….the ba…st….ard!! The lights of Dublin Port and all back to the bus. Paul plonked us safely on terra firma and we all hugged, kissed and said our au revoirs, sláinte’s, etc etc promising to meet again on the next trip. Everyone agreed that this was the best ever. The Murphy’s handed out invitations to the Grand Unveiling of their Graham Stuart picture and said that guided tours would commence early in the new year. With that, another remarkable and thoroughly enjoyable weekend had ended as we headed for all points north, south and west of Dublin Port. See ya Dave, See ya Alan. Now that the haze is lifting I wish to thank the committee for all their great, hard, time-consuming work in arranging another great boat trip. Peter Pieman, Kevin, Tom, and Big Dunk (the icon) all worked tirelessly to ensure that no stone was left unturned. Paul once again for his brilliant driving. The overnight worked a treat also. To all my fellow travellers, ye were brilliant once again. Thanks for a wonderful time and great memories. I have no doubt that we’ll be talking of this legendary weekend for years to come and hopefully, we will all attend an Everton Derby Heroes night with Lukaku, Mirallas, Barkley, Coleman and Co. in attendance.